Author: Dilip D Tanna[1*], Ashok K Shyam . Private Clinic, 3A new queens road back bay view , mama parmanand marg. Mumbai 400004, India. Material and Methods: Retrospective review of 6 cases (4 males and 2 females) was done. Two cases were primarily treated with closed reduction and cast while others underwent surgical procedures ranging from single to 4 procedures. All were treated with open reduction, strut bone grafting using iliac crest bone graft and internal plate fixation. Darrach’s procedure was done in 4 cases and Sauvé-Kapandji in 2 patients after distal radius reconstruction. Supplementary wrist splint or below elbow plaster cast, was given in all cases for 3 wks with gradual mobilization. Keywords: nonunion distal radius fracture, open reduction internal fixation, bone grafting, Sauvé Kapandji, Darrach’s procedure. Distal radius fractures are one of the commonest fractures encountered in orthopaedic practice. Due to metaphyseal location, most fractures unite and nonunion is an unfortunate occurrence that poses a difficult scenario to treat [1,2]. Treatment of nonunion distal radius fracture depends on the size of the distal fragment, bone quality, amount of radial shortening, condition on distal radioulnar joint (DRUJ) and patients demands [1,2,3]. In cases with thin distal fragments, wrist fusion is suggested while with a sizable distal fragment a reconstruction is reported to be successful in maintaining the wrist range of motion [2,3]. In cases of distal ulna instability or incongruity procedures like Sauvé Kapandji procedure or Darrach’s procedures are combined with stabilization of distal radius [2,4,5,6]. However literature is still sparse and guidelines are still unclear. The current series adds our experience of 6 patients of nonunion distal radius treated surgically and is accompanied with detailed literature review to propose a guideline for treatment of such nonunions. A retrospective review of database was conducted and six cases of nonunion distal radius presenting to us during last 10 years [between 1997 to 2010] were included in the study. There were 4 males and 2 females with mean age of 47.8 (range 22 to 91) (Table 1). Out of 6 patients 5 were AO Type A and 1 was AO type C. Five cases were closed while one was grade 1 compound primarily. Four cases were fall on outstretched hands while two cases were fall from height. However since all cases were treated at other centres, direct assessment of soft tissue injury was not available to us. One patient was diabetic and one was hypertensive. One patient was chronic smoker while rest had no other significant co-morbidities. Cases 1 and 2 were elderly and were treated primarily with a cast but continued to have pain and deformity after cast removal. The remaining four were treated operatively with ORIF using simple non-locking distal radius plates. Two were multiply operated with same procedure and presented with implant failure. 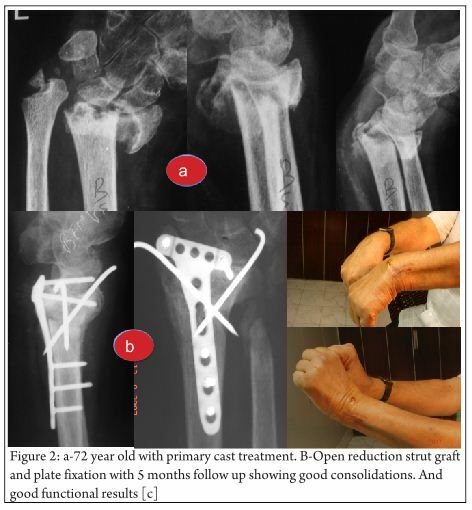 One case had primary open reduction internal fixation with non locking distal radius plate. The repeat surgery involved implant removal and re-application of cast. The second case was primarily treated with distal end radius non locking plate. Second surgery was only local bone grafting. Third surgery was implant removal and re-application of same implant with bone graft. Fourth surgery was implant removal after which wrist was simply immobilized in a below elbow cast at which time the patient presented to us. There were no infected nonunions. Only one case was atrophic nonunion while the others were oligotrphic. All patients complained to pain, deformity with functional limitation in carrying out daily activities comfortably. Under general anesthesia, scar tissue was excised and adjacent bone surfaces were freshened. Tri cortical cortico-cancellous bone graft was obtained from iliac crest along with extra cancellous bone graft. This strut graft was trimmed to fit in the gap at the fracture site, and was wedged in the non-union giving it good stability. Further cancellous graft was put in the remaining, bone gap. Volar locking plate was applied with divergent screws engaging in the styloid process and in medial end of the radius. One patient operated many years back before the era of volar locking plates was treated with ordinary dorsal plate. This fixation was supplemented by K wires. Darrach’s procedure was done in 4 cases and Sauvé-Kapandji in 2 patients after distal radius reconstruction. We preferred Darrach’s procedure in elderly patients in our series and did Sauvé Kapandji for younger patients. Supplementary wrist splint or below elbow plaster cast, was given in all cases for 3 wks. Period. Gradual mobilization was started after 3 weeks with intermittent splint use. At 6 wks. External support was discarded and further mobilization continued. Figure 1 and 2 show two typical cases of our series. The key to the procedure is the iliac crest block graft that offered stability and restored length (Fig 3). Nonunion of distal radius fractures are rare and no definite guidelines are available. We operated 6 of such cases using principles of strut graft, internal fixation and a DRUJ procedure. Union was achieved in all cases with good functional results. 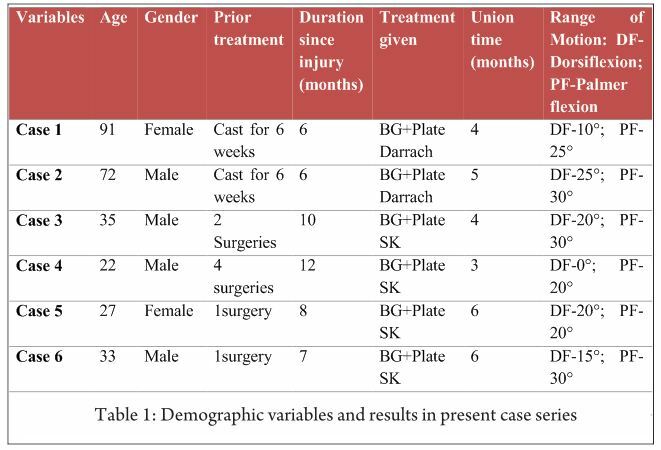 A detailed literature review revealed 20 publication on distal radius fracture nonunion with total of 77 cases reported (Table 2) [1-4, 7-22]. Variety of factors were considered while making a clinical decision in these articles. 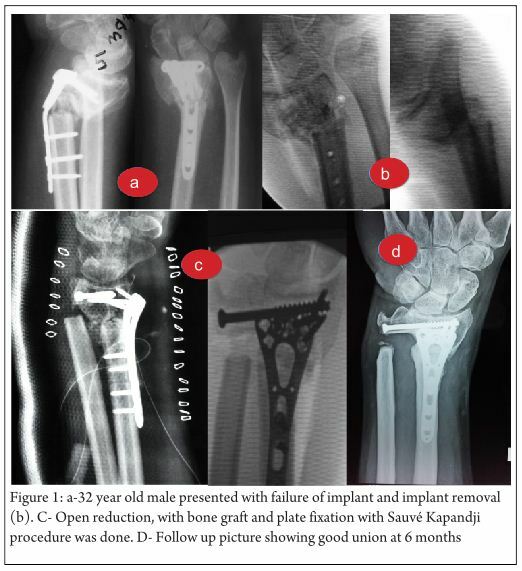 Wrist fusion was reported by early articles and may be needed in cases with severe collapse, poor bone quality and as salvage procedure after repeated surgery [1, 19]. Earlier the size of distal radius fragment was considered to be very critical. Segalman and Clarke suggested that in cases with less than 5 mm distal fragment size, reconstruction will fails and thus primary wrist fusion should be attempted . Four years later, Prommersberger et al suggested that in cases with less than 5 mm distal fragment can still be reconstructed if bone stock is good and stable fixation can be achieved . The main surgical procedure for nonunion distal radius is open reduction, freshening of nonunion, iliac crest bone grafting to achieve as much radius length as possible and stable internal fixation using a plate construct. Stability is one of the key elements in treatment of distal radius nonunion. In present series a combination of techniques are used to archive stable fixation. Corticocancellous graft not only provides a biological stimulation but also behaves as a mechanical support to maintain the radial length. Volar plating and additional K wires were used to achieve stable fixation and good results were achieved in all our cases. Two studies have reported use of biplanar fixation of distal radius by using two plates at right angle to each other [15,16], however in our series we could achieve good results with single volar locking plates. Procedures on DRUJ are needed in cases with arthrosis, instability and incongruity of DRUJ or where there is severe shortening of radius . There are two procedures that have been used, the Darrach’s procedure and Sauvé Kapandji procedure. The indications and preference of one procedure over other is still debatable. Advantage of Sauvé Kapandji is that it provides a broad support to carpus bones and thus may prevent deformities or subluxation of the carpus and maintains good load transmission . Again it is reported older patients with less demands will do well with a simpler Darrach’s procedure while Sauvé Kapandji is preferred in younger individuals. We preferred Darrach’s procedure in elderly patients in our series and did Sauvé Kapandji for younger patients. One specific disadvantage of Sauve Kapandji procedure was mentioned by Karuppiah and Johnson . They recommended against use of this procedure in cases where severe radial collapse has occurred but length was restored by surgery. They hypothesized that due to restoration of length there will be significant amount of tension on the ulna soft tissue sleeve which may lead to restricted forearm rotation. They also pointed on importance of maintaining adequate tension in this soft tissue sleeve to prevent ulna stump instability. Justin and Sheung-tung reported a case where mid-shaft ulnar shortening osteotomy was done to reduce the DRUJ . They fixed the ulna osteotomy with additional plate and reported good result. Probably this procedure can be used in cases with no DRUJ arthrosis. Failure to address issues of DRUJ have led to persistent pain even in cases with good radius union  and thus DRUJ should always be considered while treating distal radius nonunion. Various factors have been proposed as cause of these nonunions. Tobacco and alcoholism are linked with increased incidence of distal radius nonunion , however none of our patients was a smoker or alcoholic. Diabetes, obesity, open fractures with soft tissue injuries are all implicated as compounding factors [3,12]. Presence of combined distal radius with distal ulna fracture [2,5], use of external fixation and used of pins and plasters [5,20] are also indicated to add to occurrence of nonunion. We feel the main reason for nonunion is unstable fixation or inadequate immobilization . In one of our case primary fracture was compound and may have contributed to nonunion. In all stability was the main issue and when a stable fixation with bone grafting was done it could achieve good results in all our cases. Although over good union rates are reported, complications like plate breakage, persistent nonunion and graft donor site infection are reported with revision surgeries. 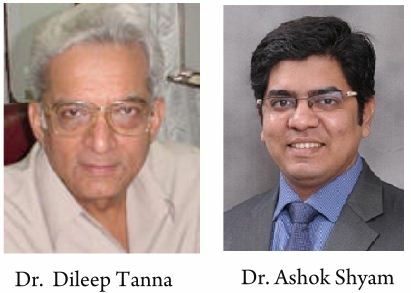 In our series we had one case which presented as failure of revised fixation and bone grafting. However repeat revision with same procedure finally achieved union. No other complications were noted. Our series has the inbuilt shortcomings of a retrospective study. However the event of distal radius nonunion is rare and hence difficult to plan large size prospective study. Different in patient profile and also available implants confound the surgical choice, however the principles of surgery remained the same and thus provide valuable inferences. In conclusion, as brief guideline, we can say that in cases of distal radius nonunion, the nonunion should be treated with open reduction, strut bone graft and stable fixation. If DRUJ procedure is needed, Sauvé Kapandji procedure should be preferred in young patients while in old patients a Darrach’s procedure will give good results. Wrist fusion should be the last resort as a salvage procedure. Most nonunions will respond well to this approach with good clinical and functional results.